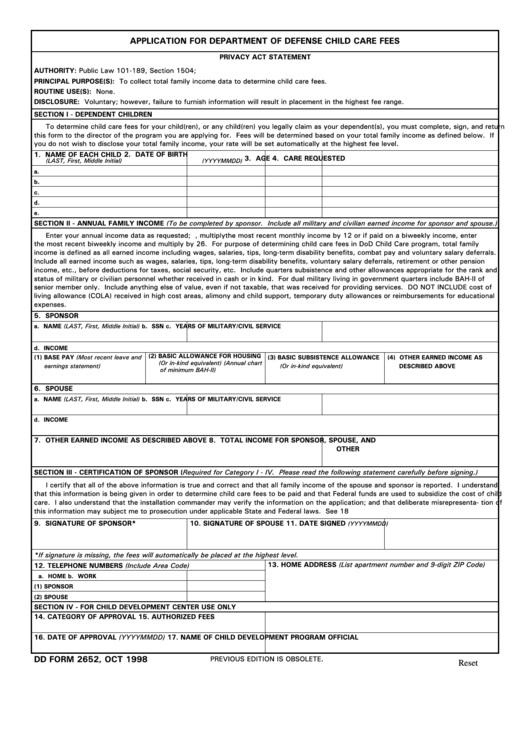 Download a blank fillable Dd Form 2652 - Application For Department Of Defense Child Care Fees in PDF format just by clicking the "DOWNLOAD PDF" button. Complete Dd Form 2652 - Application For Department Of Defense Child Care Fees with your personal data - all interactive fields are highlighted in places where you should type, access drop-down lists or select multiple-choice options. AUTHORITY: Public Law 101-189, Section 1504; E.O. 9397. PRINCIPAL PURPOSE(S): To collect total family income data to determine child care fees. DISCLOSURE: Voluntary; however, failure to furnish information will result in placement in the highest fee range. you do not wish to disclose your total family income, your rate will be set automatically at the highest fee level. income is defined as all earned income including wages, salaries, tips, long-term disability benefits, combat pay and voluntary salary deferrals. this information may subject me to prosecution under applicable State and Federal laws. See 18 U.S.C. Section 1001. *If signature is missing, the fees will automatically be placed at the highest level.